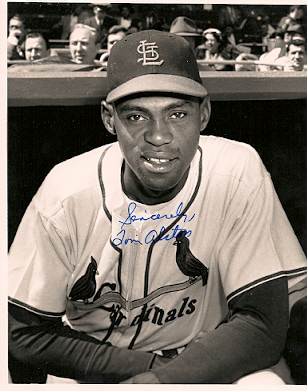 Tom Alston, the first black Cardinals’ player. Despite the title, this is just one thought on 42. And it’s not even about 42. It’s about the generations — well, one player, really — of black and Latin ballplayers that broke the color barrier of the lily-white ballfields of MLB and its affiliates. Jackie Robinson’s (and Larry Doby’s and Hank Aaron’s and etc.) trials are well-documented. The new god-making movie on the two years of Jackie’s life only scratches the surface of what he went through. There were really only two scenes of the out-and-out threat facing him: one, in Sanford, Florida when rumors of a mob coming forces him to move locations (the scene ends with a somewhat humorous button); and the second, when Branch Rickey takes out three folders full of death threats sent to Robinson just halfway through the season.But the Ben Chapman saga, and the Phillies’ Southern manager is played quite brilliantly by Alan Tudyk, I think, is treated more with the narrative that Chapman himself perpetuated in the decades following: that he screamed the epithets equally as gamesmanship, as ardent racism. Robinson was a trailblazer nonpareil. But as this excellent essay from The Atlantic points out, it wasn’t until twelve years later that the last team (the Red Sox, from heavily racist Boston) that the final team integrated. And for literally decades, players of color were subjected to terrible abuse that went far beyond gamesmanship in Southern (and not-so-Southern) ballparks. Almost thirty years later as 1974, Aaron was subjected to numerous death threats as he approached the Babe’s career home run record. But maybe no black player typifies the amount of pressure and insanity that came with integrating a traditional industry of America than the relatively unknown Tom Alston, the first black player for the St. Louis Cardinals. There’s almost nothing written about him, but he, like Robinson, and like so many of African-Americans who were subjected to segregation at home, joined the Armed Forces during World War II. After being discharged from the Navy in 1946, Alston played baseball at North Carolina A&T. He played for the semi-pro Goshen-Greensboro Red Wings, then the independent colored Jacksonville Eagles, touring through Canada. In 1952, he was brought on to the first all-black minor league team: the Porterville Comets (California) in the Class-C Southwest International League. The Cardinals, doing a kind of strange search for their own color barrier-breaking player, alighted upon Alston after St. Louis owner August Busch Jr. heard about him. (By this time, Alston was playing for the PCL’s San Diego Padres.) The Cards already had a bunch of black players in their organization, but the big, slugging first baseman struck them as the guy to break into the majors in 1954. He started off well, but had a mediocre rookie season, batting .246 over just 66 games; he only played 25 more in his career. In April 1957, Alston lost 15 pounds during spring training, and was checked into a hospital a month later. This article from the St. Louis Post-Dispatch gets a little more into it, but Alston was diagnosed with neurasthenia, an emotional disorder caused by stress or anxiety. He’d been hearing voices for some years by then, and had been dealing with the disease for at least four seasons. The Cards offered to keep him in St. Louis to procure help for his condition, but Alston wanted to move back to Greensboro to be near his family. In the fall of 1957, he tried to commit suicide in his car; a month later he burned down his local church and was institutionalized. Released a decade later, Alston was out for two months before setting his apartment on fire, and remanded to another hospital. He lived on Social Security and Disability from 1969 to 1993, when he died of prostate cancer, mostly unheralded by MLB. Whether or not there was a link between Alston’s experience of breaking the color barrier for Missouri’s major league ballclub is almost moot. I cannot imagine what it was like for any of these ballplayers, and I’m, frankly, amazed that more of the early African-Americans who integrated the game at minor- and major-league levels didn’t succumb to nervous disorders.